May 18, 2018. 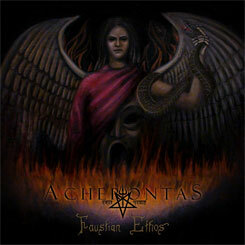 Acherontas are emerging with their seventh studio album, containing eight songs. Prepare for the journey. Official statement: "Faustian Ethos...a sacrament of Devil's Art and Magic. The Coven of Acherontas enters the indisputable paths of the unspeakable to transgress the Infallible traditions beyond the mundane perception. Originally crafted during the procreation of 'Amarta', the material of 'Faustian Ethos' was chosen to become a separate entity, following a different musical and ideological approach. Eight offerings to the great and everlasting Work, eight Keys to the deepest layers of the Abyss. Exploring multiple crossroads ,the Coven return to the Western path, two years after the Union release with Nastrond. 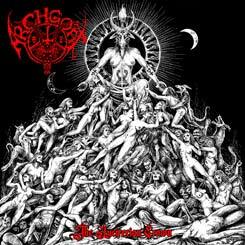 Art, religion and philosophy blend within the spectre of straight-edged and razor-sharp Black Metal, devoid of ornamental elements, reaching the very core of irredeemable Black Magical, Devilish Art. The most intense, profound and apocryphal chapter of the musical/magickal "Ma-Ion" trilogy is taking form and, like a final element, completes the alchemy of this esoteric work. Rooted deeply into the substantial core of our tradition, it invokes the Faustian spirit once again, as the Sun sets into the ruins of modernity. The triangle shall be crowned with an oak wreath and the cycle shall be completed, yet for another one to begin".